TMW’s Design features the “Gods of Transportation” statues, as seen on the Hope Memorial Bridge, competing in a Tug-of-War match. The quote, “There’s Only One Thing Left to Do, Win the Whole Trucking Thing” is a play off of the classic line from the Cleveland Classic movie, Major League. 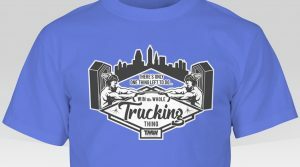 This shirt cleverly combined the God’s of Transportation to represent that they are a logistics company, the skyline and movie quote to represent their city pride, and the Tug-of-War match representing their competition in the Cleveland Corporate Challenge! Show off your Team Pride by creating uniforms for your company teams! 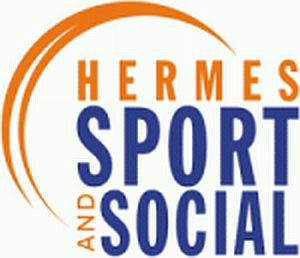 …And the image will be uploaded to this page. Judges that will be in attendance at our events will vote to determine the T-Shirt Challenge winner to be announced at the Closing/Awards Banquet in August! Shirt design MUST be submitted to be eligible. T-Shirt Challenge judging will be done throughout the season by Corporate Challenge officials in attendance at events.